WorldClassRoom FAQs - How do I create a learning module? How do I create a learning module? 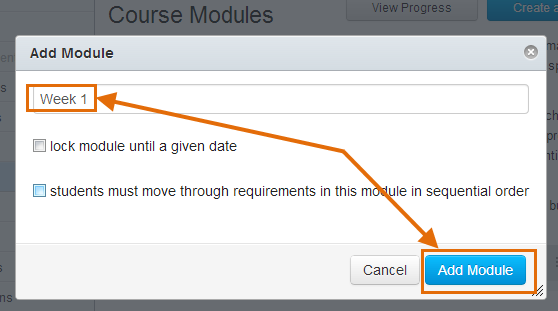 Click on Modules in the Course Tools menu. Note: Modules will be greyed out in your Course Tools menu and students will not be able to see the Modules link until you have created at least one module. On the Course Modules page, click the Create a Module button. In the Add Module pop-up window, enter a Module Name (e.g., Week 1) and click the Add Module button. The Course Modules page will reload and the new module will appear. Once you have created a module, see the FAQ "How do I link content into a learning module?" What is a weekly learning module?